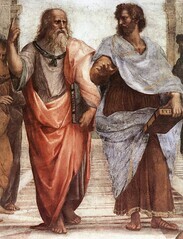 Plato was the Einstein of Greece’s Golden Age and his work founded Western culture and science. Dr Jay Kennedy’s findings are set to revolutionise the history of the origins of Western thought. Dr Kennedy, whose findings are published in the leading US journal Apeiron, reveals that Plato used a regular pattern of symbols, inherited from the ancient followers of Pythagoras, to give his books a musical structure. A century earlier, Pythagoras had declared that the planets and stars made an inaudible music, a ‘harmony of the spheres’. Plato imitated this hidden music in his books. The hidden codes show that Plato anticipated the Scientific Revolution 2,000 years before Isaac Newton, discovering its most important idea – the book of nature is written in the language of mathematics. The decoded messages also open up a surprising way to unite science and religion. The awe and beauty we feel in nature, Plato says, shows that it is divine; discovering the scientific order of nature is getting closer to God. This could transform today’s culture wars between science and religion. “Plato’s books played a major role in founding Western culture but they are mysterious and end in riddles,” Dr Kennedy, at Manchester’s Faculty of Life Sciences explains. “In antiquity, many of his followers said the books contained hidden layers of meaning and secret codes, but this was rejected by modern scholars. “It is a long and exciting story, but basically I cracked the code. I have shown rigorously that the books do contain codes and symbols and that unraveling them reveals the hidden philosophy of Plato. This will transform the early history of Western thought, and especially the histories of ancient science, mathematics, music, and philosophy. Dr Kennedy spent five years studying Plato’s writing and found that in his best-known work the Republic he placed clusters of words related to music after each twelfth of the text – at one-twelfth, two-twelfths, etc. This regular pattern represented the twelve notes of a Greek musical scale. Some notes were harmonic, others dissonant. At the locations of the harmonic notes he described sounds associated with love or laughter, while the locations of dissonant notes were marked with screeching sounds or war or death. This musical code was key to cracking Plato’s entire symbolic system. However Plato did not design his secret patterns purely for pleasure – it was for his own safety. Plato’s ideas were a dangerous threat to Greek religion. He said that mathematical laws and not the gods controlled the universe. Plato’s own teacher had been executed for heresy. Secrecy was normal in ancient times, especially for esoteric and religious knowledge, but for Plato it was a matter of life and death. Encoding his ideas in secret patterns was the only way to be safe. Plato led a dramatic and fascinating life. Born four centuries before Christ, when Sparta defeated plague-ravaged Athens, he wrote 30 books and founded the world’s first university, called the Academy. He was a feminist, allowing women to study at the Academy, the first great defender of romantic love (as opposed to marriages arranged for political or financial reasons) and defended homosexuality in his books. In addition, he was captured by pirates and sold into slavery before being ransomed by friends. Over the years Dr Kennedy carefully peeled back layer after symbolic layer, sharing each step in lectures in Manchester and with experts in the UK and US. He recalls: “There was no Rosetta Stone. To announce a result like this I needed rigorous, independent proofs based on crystal-clear evidence. “The result was amazing – it was like opening a tomb and finding new set of gospels written by Jesus Christ himself. Dr Kennedy’s findings are not only surprising and important; they overthrow conventional wisdom on Plato. Modern historians have always denied that there were codes; now Dr Kennedy has proved otherwise. … that takes us back to around the time the DaVinci Code hit the shelves and I think it should be pretty much obvious from the nachleben of the theories in this list, that using the word ‘code’ will pretty much guarantee you won’t be taken seriously in scholarly circles. Clearly, you’ll get plenty of press coverage but your theory — even if it has legs — likely won’t live much beyond your fifteen minutes. The reason I mention this is because Jay Kennedy’s hypothesis does seem to have some merit, but likely will not be engaged in a scholarly fashion because of all this ‘code’ business that’s being attached to it. As mentioned in the above-mentioned press release, the theory is actually presented in a scholarly journal — Apeiron — and that article (perhaps in draft form?) is available at the author’s home page, along with some other useful summaries. From the Apeiron article, we learn that Dr. Kennedy has done some serious research, especially in the realm of stichometry (counting/measuring lines and line lengths in ancient works). He picks up on the long-established notion that ancient scribes had a specific line length of 35 characters (give or take) and from that has worked out the lengths of Plato’s works. Taking that a step further, he has found a principle of structure/organization which seems to be based on the Pythagorean musical scale (breaking things into twelfths) with ‘signposts’ which are evident across dialogs at specific ‘twelfth’ locations. Dr Kennedy would like us to see some symbolic meaning in all this, and perhaps there is some, but even just from a structural point of view this seems to be an important discovery. It is from this, e.g., that Dr Kennedy can reasonably explain why Aristotle considered Plato to be a Pythagorean, a claim which has caused a fair bit of scholarly noggin-scratching in the past. It is also interesting that the hypothesis can be used to check the authenticity of some of the works ascribed to ‘Pseudo-Plato’ , which actually confirms many conjectures made by scholars. of writing with secondary or symbolic levels can have no simple answer. in the dialogues may serve several purposes. of their studies of the metaphysics allegedly hidden in the dialogues.